Introducing the F-22 Raptor fighter: Air Dominance DVD. 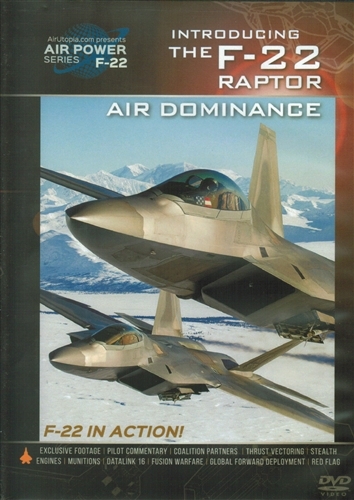 This DVD covers many aspects of the F-22 Raptor including stealth engines, thrust vectoring, munitions and datalinks. See exclusive footage of the F-22 in action along with pilot commentary and much more! Air Supremacy is a position in war where a side holds complete control of air warfare and air power over opposing forces. It is defined by the United States Department of Defense and NATO: The degree of air superiority wherein the opposing air force is incapable of effective interference. Air Superiority is what Lockheed Martin and the United State Air Force designed the F-22 to do. Run time is about 52 minutes. Format is NTSC DVD and region-free.